D.R. Templeman recognizes that sometimes all you need is a few springs to test out your concept and you cannot wait 3 to 4 weeks to get them. Therefore, we developed our online stock springs catalogs for engineers who are looking to get “something close” in order to test out an idea or build a prototype. We have separate catalogs for compression springs, extension springs, torsion springs and spring guides. Most of the stock springs in our catalogs started out as a custom spring for a particular customer. We have cataloged the overruns of these parts in order to make them available for those looking to develop new products. Over the years, we have also added some stock springs of our own design to fill in some of the gaps. Changes to these catalogs happen frequently, with new parts being added and out of stock/obsolete parts being deleted. Available quantities can range from a few pieces to several thousand. All parts in these catalogs are offered subject to prior sale. You can search and buy our stock springs through our online catalogs by clicking the links below. Once you are in a catalog for a particular type of spring, e.g. a straight compression spring or a stock extension spring, the easiest way to find what you want is to use the Search Items function. This will bring up a fill in the blanks screen where you can specify ranges for the spring characteristics that are most important to your application. Then click Search to bring up a listing of all of the parts that meet your requirements. 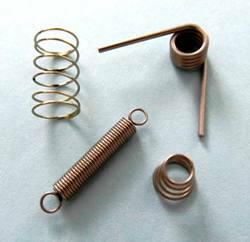 We hope that our stock spring offerings will help you with your product development. Then once your idea is more fully developed, we will be happy to assist you with a custom spring designed to economically meet your exact requirements.